Le Corbusier was a twentieth-century Swiss-French architect, urban planner, designer, writer and painter. 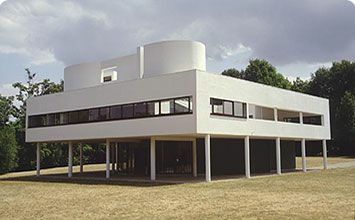 Le Corbusier was a pioneer in modern architecture and his priciples were integral to the hugely popular International Style of architecture. Philip Johnson was an American architect during the twentieth century. Along with Alfred H. Barr, Jr. and Henry-Russel Hitchcock, Johnson helped found the "International Style" of architecture, which stressed functionality over form. Johnson's buildings are considered by some the architectural equivalent of Minimalist art installations, in which the object relies on its surrounding environment for its artistic effect. Mies van der Rohe was one of the founding fathers of architectural Modernism and The International Style. Utilizing modern materials and mass production strategies, his buildings rejected surface ornament in favor of a sleek and compact geometry. Saarinen's developed a personal, often sculptural, visionary direction and an adventurous spirit as we see in The Saint Louis Arch, NY's TWA Terminal, and GM Headquarters. First published on 14 Apr 2017. Updated and modified regularly.